Do you offer five-star service? You are writing an email response to a customer. You want to communicate that you are excited about locating a lost order, so it is appropriate to draft the email message in all capital letters. An angry customer expresses frustration with being transferred to several people in different departments. The best way to handle that scenario is to assure the person that you will handle his or her inquiry from this point forward. You will not transfer the customer to someone else. A customer asks you where a certain item is in your store. The best service you can give is to provide detailed directions to the product’s location. A shoplifter takes an item from a store’s shelf and runs out the door with it. A good customer service rep would run after the thief. False. The rep used the customer’s first name, which is too informal for a first meeting. Use the last name with a title, such as Mr. Smith or Ms. Jones, until you are certain a first-name basis is appropriate. False. Email etiquette rules discourage using all capital letters. Customers may interpret all-caps messages as yelling. True. Never put angry customers back into the same situations that upset them. Reassure them that you will resolve their issue. False. The best way to handle a customer’s question about the location of a product is to walk the person to its exact location. That applies to locations on your website as well, where you can virtually guide people to the proper location. When you cannot leave your post to take a customer to a location, offer detailed directions. If necessary, write down the aisle number or provide a map of the store with the desired location circled with a colored marker. False. Although apprehending a thief seems like a heroic act, you could be hurt in the process. Many employee handbooks state that employees should not take the law into their own hands. Instead, call security or the police. Five correct answers: Congratulations! You are a service superstar. Three to four correct answers: You are on your way. Keep improving your skills. Fewer than three correct answers: Don’t give up on developing your service abilities. Take advantage of any training your organization offers. 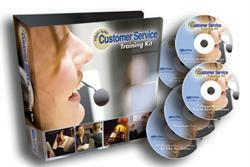 First-Rate Customer Service Training Kit: A budget-friendly way to train your customer service reps! Learn more! Noisy co-workers are the top workplace pet peeve for respondents to a recent First-Rate Customer Service Forum survey. Almost two-thirds of readers said that loud talking in cubicles or public areas is a source of irritation. Thirteen percent said their top pet peeve is messy team members. Only a few respondents said unpleasant odors from food and inconsiderate co-workers who don’t stock supplies annoy them. You spend as much as 75% of your waking hours on work-related activities. Learn to turn difficult workplace interactions into constructive relationships with “Mission Positive.” The report offers guidance on how to stay upbeat amid day-to-day frustrations at work. Special thanks to those who provided feedback to last month’s survey. Read on to share your New Year’s resolutions. We’ll report next month on what areas your colleagues plan to improve in 2012. SERVICE TEAM MANAGERS: BUILD STRONGER TEAMS WITH THESE BRAND-NEW PRODUCTS! 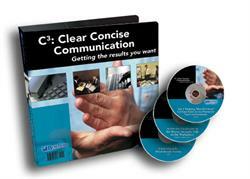 C3: Clear Concise Communication will teach you and your reps how to communicate in a direct manner—across all channels—so that you get the results you want while you avoid the communication pitfalls that can wreak havoc in the workplace. Communicate effectively in any situation. Identify barriers that interrupt communication flow. Break bad habits that have impeded successful communication. Assess needs quickly in order to improve responsiveness. Feel comfortable responding to unexpected situations. Detox Your Workplace! will teach you how to address the negative behaviors that are hurting your team’s collaboration, productivity, customer service and bottom line. 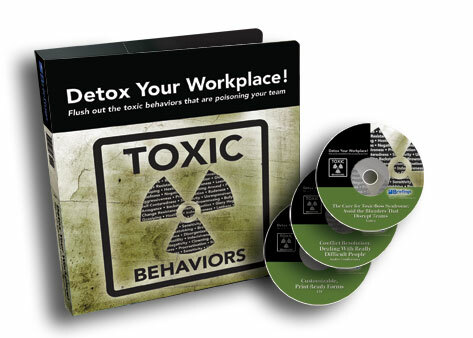 Even if you feel your team is healthy, you can use the advice presented in this training kit to recognize warning signs and flush out toxic behaviors—before they contaminate your team. Recognize the kinds of management behaviors that destroy teams. Avoid becoming a toxic manager. Assess the causes of difficult behavior on your team. Understand different personality styles by using the D.I.S.C. method. Resolve conflicts with difficult people. This entry was posted in First-Rate Customer Service Forum and tagged Communication, Customer service, training. Bookmark the permalink.